Rockman Corner: Dr. Wily Trophy Confirmed for Super Smash Bros.
Dr. Wily Trophy Confirmed for Super Smash Bros.
"Pic of the day. Here's the trophy gallery for the 3DS version. You can rotate the trophies by drawing circles on the bottom screen. Super Smash Bros. Brawl had tons of trophies, but rumor has it that the 3DS version alone may have more than Brawl. 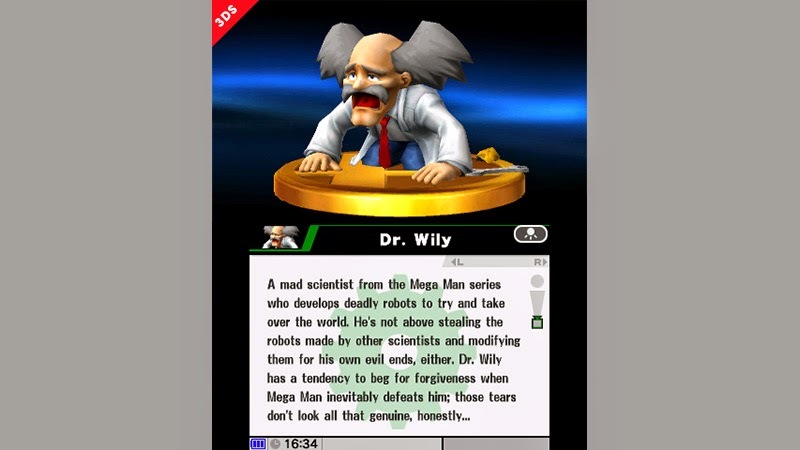 Looks like the Dr. Wily that we made from scratch for the 3DS version is on his knees in disbelief." Sakurai adds it's also possible to purchase trophies with in-game currency; an option good for players having trouble obtaining certain trophies. And hey, they even go on sale sometimes too! Capcom? You know what must be done. Let the Nintendo guys do the thing. These models would look soo cool in a new 2.5D Mega Man game.... :/ probably not gonna happen anytime soon.. Glad Wily is a trophy though! Well maybe not soo much the Wily trophy, but definitely the MM smash model. Selling trophies... They learned too much with capcom. I don't like this one bit. It's not real money being used here. This isn't a micro transaction. It will most likely use 3DS Play Coins, or some currency earned by playing the game. Aye. Judging from the other image in the post of the day(not shown here) you can choose to either buy them with the smash coins you earn from gameplay, or the 3DS play coins you get from walking around, but there is no option to use real money. I figured this was something there'd be misunderstanding about.